There may not be anything more relaxing than the soothing sound of water cascading gently over rocks or the sight of a still pond full of vibrant koi. Rice’s brings this peaceful, calming focal point to your landscape with fountains, bubblers, ponds and waterfalls. A well-designed water feature adds instant beauty. 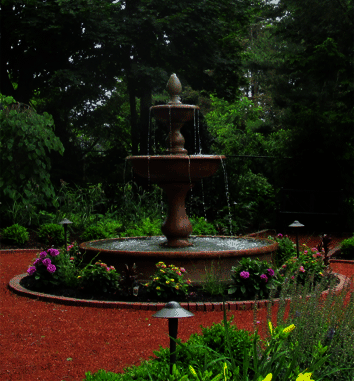 We’ll work with you to incorporate a natural-looking custom water feature that works with your landscape, from the smallest fountain or pond to large, stunning waterfalls. Leave the maintenance to us. Our full-service, year-round Estate Landscape Management service will protect your investment throughout the year and for years to come. Our zen moment-making experts are ready to bring peace and calm to your landscape. Fill out the form below to request a free quote.